Each year, Miami Bridge Youth & Family Services holds an annual gala to benefit its life-changing, residential and community outreach services for local kids and families. 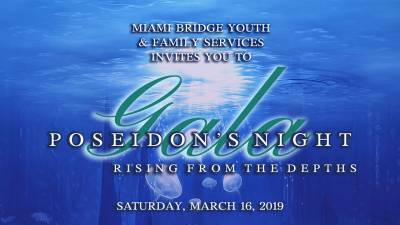 We are thrilled to announce that our annual gala, Poseidon's Night: Rising from the Depths, will be held on Saturday, March 16, 2019 at 7:30 p.m. at the JW Marriott Marquis Miami. Our gala promises to lead you on an adventure through Poseidon's watery realm, where you will encounter a deluge of provocative delights for all your senses! If you've been to any of our previous Miami Bridge galas, you know you'll have the time of your life. If you haven't been to one, it's time to get your feet wet! Click here to purchase tickets, learn more about sponsorship opportunities, or how you can contribute to our organization.